Store checkout lines should be moving a little faster these days. The four major card networks—MasterCard, Visa, Discover and American Express—no longer require cardholder signatures for in-store credit and debit purchases. The only caveat: Visa still requires a signature if the merchant doesn’t accept EMV chip cards. 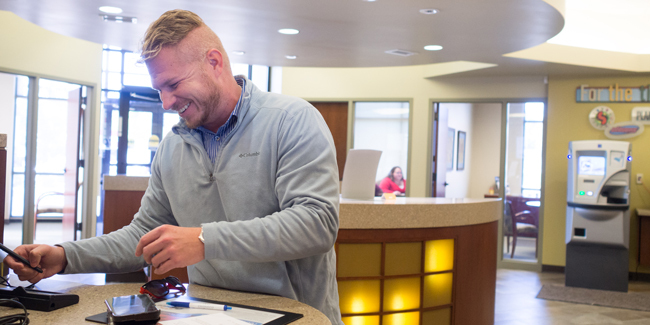 “One of the main reasons for removing the signature requirement was to make in-store purchases faster and more convenient,” says Jim Bemboom, card services supervisor at Dupaco Community Credit Union’s Pennsylvania branch in Dubuque, Iowa. Signatures also are being abandoned because they’re no longer necessary to combat card fraud. EMV chip cards and other technologies, such as tokenization and biometrics, offer the best security for cardholders during in-store transactions, Bemboom says. Dupaco has been issuing Visa credit cards with EMV chips since 2015 and MoneyCard debit cards with EMV chips since March 2017. You also can pay securely with your mobile wallet. But until last month, the signature requirement for in-store purchases was in place for merchants, unless a cardholder’s four-digit PIN was used. Merchants can now choose if they want to collect a signature, and some might still ask for it. So, what happens with that signature strip on the back of your card? “If a card is not signed, a merchant has the right to refuse it,” Bemboom says.